Port Washington is the seat of Ozaukee County, which is one of two counties in Wisconsin with an income inequality gap wider than the national average. In a time when technology is driving social, business and economic change, the consequences of another defining characteristic of the era — rising income inequality — are shaping political dynamics around the world. Understanding what drives this gap and forecasting its effects is a complex challenge. Documenting the phenomenon, in Wisconsin and the United States, however, is a relatively simple first step to better understand the issue. During the boom years between World War II and the 1970s, a growing American middle class narrowed the income gap between high and low earners. But since the early 1980s, income inequality has been rising, both in Wisconsin and nationally, and economists and policymakers have become increasingly aware of and concerned about this trend. Social sciences researchers have been attempting to understand the causes and consequences of rising income inequality for decades. Over the same time, the widening gap has entered the public consciousness, particularly following the Great Recession, and it has increasingly become a focal point of politics in many nations. Moreover, the global business community is beginning to express concerns about the long-term impact that rising inequality may have on capitalist economies. Although social scientists, particularly economists, disagree on the potential impacts of rising inequality on the economy, there is growing consensus about its increasingly disruptive political effects. While attaining wealth is reflective of the American dream, many people may fear they are either being pushed downward out of the middle class, or that upward mobility is becoming more difficult. But discussion has largely focused on national and global income trends, leaving the picture less clear at state or local levels, including for Wisconsin. Data from Sam Houston State University and the U.S. Census Bureau can help illuminate income inequality in Wisconsin. Exploring income gap trends can be tricky because of the various ways analysts define and measure them. For example, how is income defined? Is it total income, just income related to work or pre- or post-tax income? Also, how are income categories defined? What qualifies as high or low income? And should scholars look at the patterns across all income categories or just those at the highest and lowest levels? Economists have debated these questions related to the definition and how variation can subtly affect analyses. Regardless, debate over specifics does not refute the overriding rise of income inequality. As examples, inequality can be calculated by looking at the share of income going to the top 5 percent of the highest income households, as well as the Gini coefficient — a widely used income disparity calculation developed in the early 20th century. The Gini coefficient compares the actual distribution of income to a hypothetical situation where income is evenly distributed. The smaller the Gini coefficient, the closer the actual income distribution is to being equal. Larger values indicate a more uneven distribution of income. Using these two measures of income inequality to compare Wisconsin against the nation as a whole reveals several patterns. The "Great U-Turn," which refers to decreasing then increasing income inequality over the course of the latter 20th century, is clear in Wisconsin and the U.S. when looking at the share of total income going to the top 5 percent of households. While the U-turn is also evident when analyzing the Gini coefficient, it is less clear compared to the top-5-percent measure. Nonetheless, it still shows that over the last 30 years, at a minimum, income inequality has been increasing. Both measures of income inequality also show that Wisconsin’s income distribution closely follows national trends. This congruity makes sense given that Wisconsin’s economy has generally tracked with national patterns. Notably, though, the level of income inequality in Wisconsin has historically been lower than the U.S. as a whole. In 2013, the income threshold to be considered among the top 5 percent of earners in the U.S. was $168,144 , while the top 5 percent of Wisconsinites was more than $18,000 lower at $149,750. The gap between the top 1 percent in the U.S. ($398,318) and Wisconsin ($307,967) is even wider, at more than $90,000. Examining Gini coefficients at the county level shows clear patterns of these regional differences across the U.S. and within Wisconsin. Higher income inequality tends to be concentrated in the southern states, parts of Appalachia and pockets where shale oil and gas production has developed in the Dakotas. In large swaths of the Midwest, including Wisconsin, income inequality tends to be lower. 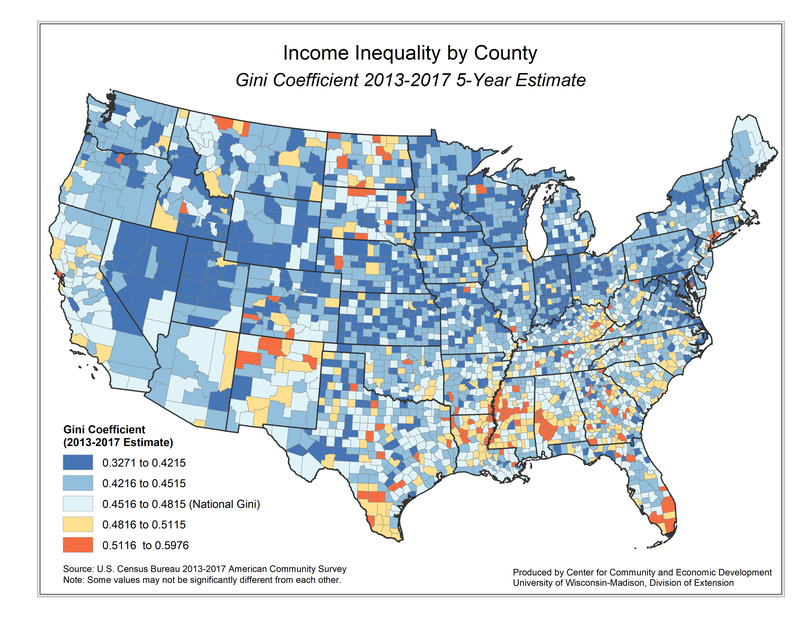 Income inequality, as measured by the Gini coefficient, varies by county across the U.S., with more acute levels more common in portions of the South and scattered in other states. The counties are color-coded based on the national average Gini coefficient. The pattern of income inequality within Wisconsin, as well as possible explanations for it, is less clear. Milwaukee and Ozaukee counties have high levels of income inequality, yet nearby Washington County has a more equal income distribution. Several northern counties, including Sawyer, Washburn, Florence and Vilas, also have higher levels of inequality relative to the state Gini coefficient. One factor that might help explain this is the migration of higher income retirees to popular amenity-filled communities in the North Woods. Still, most Wisconsin counties with higher inequality are still more equal than the national average. Ozaukee and Sawyer are the only Wisconsin counties that are more unequal than the nation as a whole. In the former, it's is due to the location of high-income communities, such as Mequon (mean household income of $172,000) and more modest-income communities, such as Saukville (mean household income of $63,000). A similar case may apply to Sawyer County, where the higher income households clustered around the county’s lakes are different from other portions of the county. Documenting the regions where income inequality is wider only tells part of the story. Community leaders, scholars and activists are also trying to figure out why inequality is rising. One possible reason includes globalization and the "financialization" of developed economies, where professionals in the financial markets earn unusually high incomes. Another potential factor is skill-biased technological change, where industrial restructuring and the introduction of new technologies can lead to a decline in jobs and wages for unskilled workers. For example, manufacturing, which has been in decline in Wisconsin for years, has moved away from repetitive assembly using semi-skilled workers to computer-driven, robotic technologies that require higher levels of training and skill. On top of that, growth in the personal services industry, such as retail, restaurants and tourism, has created more low-paying jobs. Some observers also assert that changes in national and state fiscal policies related to taxation and social support programs, including minimum wage and right-to-work laws, can help explain rising inequality. Reducing investments, in say public education, can place limits on upward mobility, which compounds rising income inequality. Despite the wide range of possible explanations, no single line of thinking completely explains rising income inequality. Furthermore, what might help explain the phenomenon in one region may not be applicable elsewhere. For instance, the movement of higher income households into high-amenity areas, often via retirement migration, does not fit neatly into any of these larger frameworks. In the end, each of these hypotheses offers one piece of a complex puzzle that Wisconsin will continue to experience for years to come. This item was originally published as part of the University of Wisconsin Center for Community and Economic Development's WIndicators series of economic reports.